I had a really nice visit today from Chad Cochrane, our local District Conservationist for the Natural Resources Conservation Service. We took a walk in the pouring rain and talked about all our conservation concerns (fencing off a seasonal stream, controlling erosion on a hillside, dealing with soil impact in high use areas, etc.). 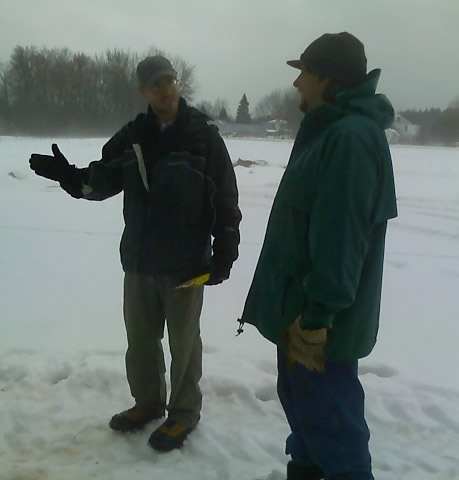 Chad had some great advice, including which projects might be eligible for funding under the EQUIP program of the 2008 Farm Bill. Whether or not we get the funding, Chad is a great example of what I wish the government could always be: efficient, highly competent, and really out to help us. A co-worker had past your site to me knowing that I only eat Organic foods. I found you post to refreshing and honest. I do hope you will be able to visit us sometime. Soil health is the most important aspect to ensure a sustainable environment for us all.